Lots of cuddly pigs in all sizes and materials. For baby, children and very big "children". 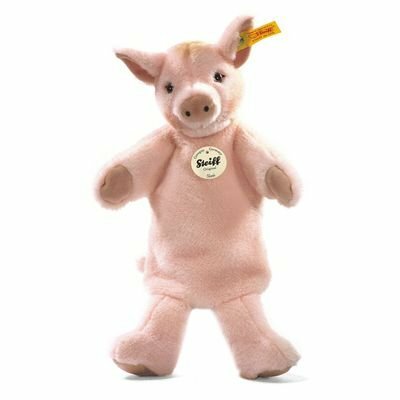 Steiff Puppet EAN 250835 Sissi Pig, ong. 30cm. 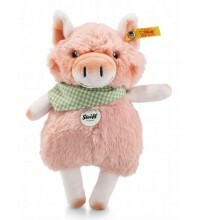 Sissi is made of Pink coloured cuddly woven fur, has safety eyes and airbrush details. Sissi is filled with synthetic stuffing material and machine washable (30 degree C). Sissi is a sweet hand puppet with arms and legs. To play your own version of The pig in the pond. 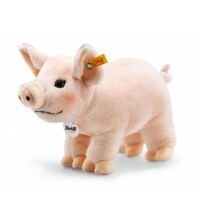 Steiff Cosy EAN 280016 Sissi Pig, 22cm. Sissi is made of Pink coloured cuddly woven fur, has safety eyes and airbrush details. Sissi is filled with synthetic stuffing material and machine washable (30 degree C). With CE mark. 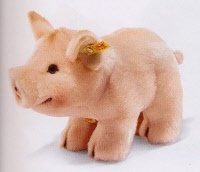 Steiff Cosy EAN 071898 Sissi Piglet, 15cm. Sisi piglet is 15 cm. / 6" tall and made out pale pink plush. He is filled with synthetic filling material and has brown safety eyes. He has brown airbrush details all over his body and face. 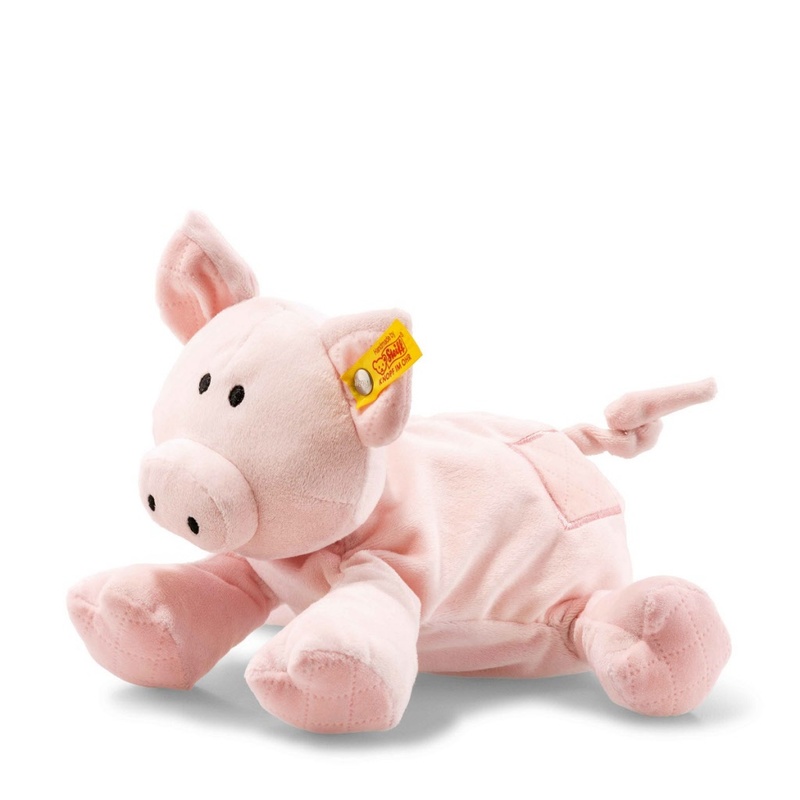 This piglet is machine washable at 30° C. Sissi piglet has the CE mark for safe toys. 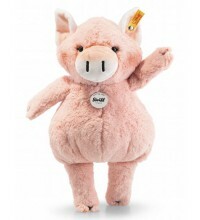 Piggy pig is a piglet made of cuddly soft woven fur. It stands on all four legs and is 30 cm tall. It has red cheeks, a cuddly snout, coloured stick-out ears and a corkscrew tail made of rubber braiding. 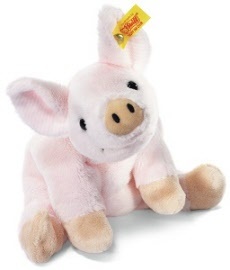 It's simply the perfect gift for your little ones to play and cuddle with.On their birthday or at Easter, this cute little piglet is certain to make your toddlers very happy. He is stuffed with synthetic filling material. He has safety eyes and is machine washable at 30° C.
Steiff EAN 241567 Soft Cuddly Friends Angie Pig, 22cm. Angie Pig gives warmth and comfort. It's a wonderful present on many occasions. It is made out of soft pink plush and stuffed with synthetic filling material and pellets. It has embroidered eyes and is machine washable at 30° C. It is with CE mark and stainless steel "Button in Ear"